Vitovska is a grape you should learn and love. 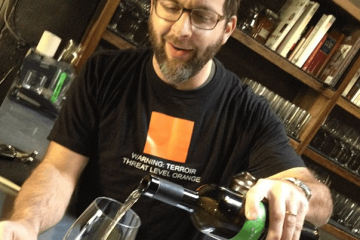 I first met Benjamin Zidarich, a famous young producer of wines made from Vitovska, at Vini Veri, a natural wine show held every year near Vinitaly, the big mother-of-all-Italian-wine-shows, in Verona. Vini Veri is kind of like an “anti-Vinitaly” where all the cool kids go to show their stuff. 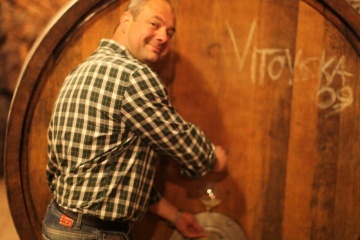 Benjamin Zidarich stood behind his little table pouring this wine labelled “Vitovska”. I thought it was the name of the wine. I had never even heard of this grape. Immediately upon tasting it, I fell in love. Zidarich’s estate is in the Carso, a remote part of eastern Friuli, where the family works a terroir based in heavily-mineral, red soils. The climate is dictated mainly by a strong wind (known locally as the bora) which pushes out from the nearby Adriatic Sea. The wines too, carry this same lonely weight of a desolate moonscape, driven by minerals and acidity. White wines from the Carso have a reputation of being heavily extracted, tannic whites, usually deep yellow or orange in color. What I love about Zidarich is that, although he does macerate his wine on the skins for a bit longer than normal (up to 14 days), the wines are light, airy and have a balanced tannic structure thanks to the acidity preserved by careful picking and perfect vineyard placement and exposure. We enjoyed the 2009 Zidarich Vitovska at Gusto in Los Angeles, where the genius of Chef Vic Casanova’s cooking was carefully matched by the elegant power of this wine. Especially perfect with his stewed trippa (tripe), the wine won us all over- even our toughest critics! Aromatically you have to experience this wine to understand it. The nose is full of jasmine tea and yeasty beer, which then deepens to orange peel and black tea. On the palate it has a weight and intensity that defies logic, as it remains light, and airy at the same time. These are magic wines from a magical place. Also, check out Jeremy Parzen’s Italian Grape Pronunciation Project for a quick lesson in Italian grapes, including Vitovska, straight from the producers’ mouths! great wines, great people, great post… 🙂 blog on sistah Joanie! These are really wonderful wines.